Last year was an incredible year of growth for us. Although we're the same two people who started this venture five years ago, so much has changed. In an effort to streamline and represent our business better, we've put some blood, sweat, and tears into a full revamp and rebrand. Our new name represents who we are now. A few years ago, we started talking with various family members about purchasing my grandfather's house once he was unable to live independently. We knew the day was coming, and I was heartbroken thinking about our family losing this home which holds so many dear memories - 65 years of love, as it was my grandparents first home together, the place my mom and her siblings grew up, and my beloved grandma and grandpa's house when I was a kid. My greatest memories took place on the tattered wooden porch swing that still hangs there today - the same one that (thankfully) put Liam to sleep those early/rough days. So on September 30th, 2015, we bought our first house. Although I have so many wonderful memories here, we wanted to make it our own before we moved in. The first thing we did was tear out the carpet to reveal these beautiful wood floors - made of oak and pine. The majority of the house has red oak strip flooring, typical of 1925, but the kitchen proved to be a greater challenge as we tried to unveil what was once just a subfloor. 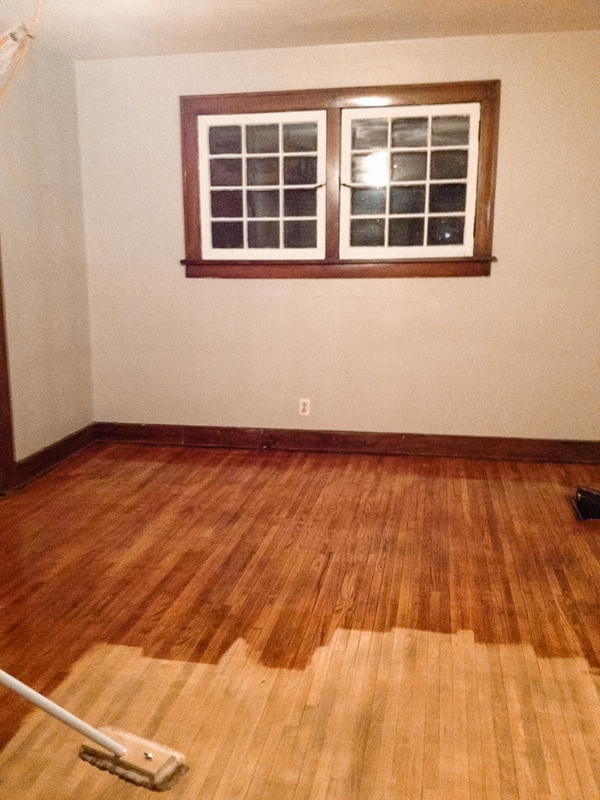 Under three layers of vinyl, one layer of original linoleum, and some black tar adhesive, Mike scraped away to uncover the yellow heart pine floors, now extinct (and very difficult to match we learned). As you can see below, it was a labor of love, and there are no regrets! Maybe one day we'll post about some of the other projects going on around here. I swear, it's going to be a 30 year project.